The following is a discussion of the phenomenolgy of writing and examines the transition from handwriting to typewriting. The focus of this discussion is how a technological innovation, the typewriter, modified the look and feel of writing as well as the modifications it brought to social structures in a society rooted in handwriting. The first script or writing known was developed by Sumerians in Mesopotamia around the year 3500 BC (Ong 1982, pp. 82-83). Since its inception, writing has served as a form of communication. Writing is a technology (Bolter, 2001, Ong, 1982) and Ong (1982) notes that while we may find this notion difficult, it is a technology in that it utilizes tools and equipment, such as the stylus, brush, pen and paper (p. 80-81). Writing is a momentous human technological invention; it is more than a mere appendage to speech as it moves speech from the oral-aural to a sensory visual world (Ong, 1982). 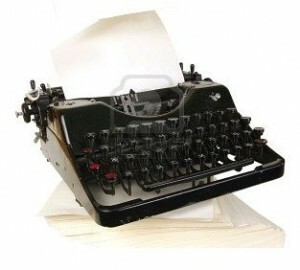 The introduction of the typewriter presented an alternative technology by which to communicate and write. The public debut of the typewriter in 1874 is attributed to Christopher Latham Sholes, the father of the Remington typewriter (Monaco, 1988). The Remington typewriter was the prototype of the modern day typewriter. The invention of the typewriter resulted in an artificial machine whereby the writing was “so neat and exact as not to be distinguishable from print” (Monaco, 1988). Bolter (2001) notes that “each writing space is a material and visual field, whose properties are determined by a writing technology and the uses to which that technology is put …moreover, each space depends for its meaning on previous spaces or on contemporary spaces against which it competes” (p. 12). The typewriter modified the look and feel of writing. Typewriting can be equated with depersonalization as each letter of the alphabet is systematically formed on the page in the exact same shape and size. Each letter is identical and uniform, whereas handwriting allowed for variation in shape and size denoting human creation. The major advantages of the typewriter technology were that of “legibility, compactness, and neatness in print, uniform size and body” (Monaco, 1988). However, this also led to the impersonal feel or sterile appearance of typewritten work. Chandler (1992) cites the philosopher Martin Heidegger, who in the 1940s expressed distain at the proliferation of the use of the typewriter, “the word no longer passes through the hand as it writes and acts authentically but through the mechanized pressure of the hand”. This lamenting is also discussed by Connor (1999) who notes that “in writing by hand, it must attend to the creation of each written line, must measure, direct, and, in short, guide the hand through each movement…by contrast, after one presses down briefly on a key, the typewriter creates in the proper position on the paper a complete letter”. Typing changes the aesthetics of the text. The look and feel of typewriting became standardized, with one inch margins, double line-spacing, five spaces to indent a paragraph being distinctive characteristics of this approach (Mason, 2001). Not only was the look and feel of writing with a typewriting different than handwriting, but it also added the element of technological noise (Johnson, 2003, Acocella, 2007). 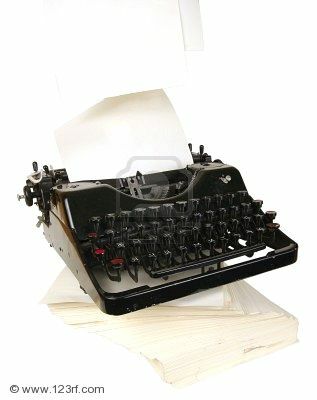 The rapid staccato of the typewriter was an authoritative sound, serving as a constant reminder of the writing process. The technology of the typewriter altered the tactile relationship with the writing process. Connor (1999) notes that typing is characterized by the suppleness of the fingers to hit the keys and notes a significant difference in typing over handwriting is that it involves two hands. “Good penmanship was a sign of virtue, character, discipline, and proper training…sloppy penmanship revealed an undisciplined education” (Porter, 2002). From such quotations, it is evident the role that handwriting played in social structures and social status. Similarly, with the introduction and proliferation of the typewriter, this writing process also had an impact on the social structure and social status of individuals. During the late 19th and early 20th centuries, the typewriter replaced handwriting for business communications (Bolter, 2001). It was also during this time that American society began admitting women into the work force, a change that “created secretarial jobs for young women who took the place of male clerks” (Bolter, 2001, p. 22). The typewriter was the ‘quintessential tool’ for women’s entry into the workforce (Bernard, 1984). While the introduction of women into the business world of men altered social structures, the positions held by women as secretaries and members of typing pools did not provide them with equal status to men or afford them independence. While employment for women did not equate to empowerment, the notion of a woman “having a job outside the home was part of the humble beginnings of the twentieth-century feminism” (Acocella, 2007). The technology of writing extends our ability to communicate with others whether the tools employed are a pen or typewriter. Handwriting and typewriting are examples of technology whose impact extends beyond the way words are put onto paper; aside from changing the look and feel of writing it also altered social structures and social status. Bolter (2001) notes that “when in history a new technology appears, it may supplement an established technology or replace it” (p.22). As the technological landscape of writing continues to change, the introduction of the computer builds upon the technology of the typewriter and as such has made the typewriter a rare technology when it comes writing. The advent of new ways of writing has emerged and whether new technologies will replace and make handwriting obsolete remains to be seen. While the phenomenology of writing will undoubtedly continue to change and evolve, it is critical to remember Postman’s assertion that “every technology is both a burden and a blessing; not either or, but this-or that” (Postman, 1992, pp. 4-5). Bolter, Jay David. (2001). Writing space: Computers, hypertext, and the remediation of print. Mahwah, New Jersey: Lawrence Erlbaum Associates. Haas, Christina. (1996). Writing technology: Materiality of literacy. Mahwah, New Jersey: Lawrence Erlbaum Associates. Ong, W. (2002). Orality and literacy. New York: Routledge. Thornton, Christina. (1996). Writing technology: Studies on the materiality of literacy. Mahwah, New Jersey: Lawrence Erlbaum Associates. This entry was posted in Research Paper and tagged handwriting, Jung, technology, typewriting, writing. Bookmark the permalink. excellent read! I really learnt a lot- you did a really good job of relating the main topic to the themes of the course…I am interested to know if the typewriter was women’s entry into the workforce in other parts of the world as well. Here in the UAE women are just starting to enter the workforce but if they are ‘locals’ they are often given high ranking positions regardless of their educational merits…. so the idea of meritocracy is one that is not neccesarily part of the criteria for landing a great position…. Thanks for your comment on my assignment; I’m glad you enjoyed the read! Most of the research I found was North American or Western-based. Exploring the impact of the typewriter in other countries or cultures would be an interesting continuation of this paper. Considering the oral culture that I am presently immersed in I was really interested after reading your assignment to find out more about the use of the typewriter here in the UAE. I found out that the typewriter was used but everything was not formally documented- so many interactions took place through speaking. For example, a business deal, an agreement possibly based on proverbs of the culture was accepted in the same way as we in a Western culture would formally document the same type of agreement. It will be interesting to see what will happen in the future with the increasing use of the Internet all over the world. Will there be a standard way for individuals to close deals? will oral culture still remain one which depends on the word of those interacting with eachother?